The Disney Den: Interactive Sorcery Scavenger Hunt in Disney World? Interactive Sorcery Scavenger Hunt in Disney World? I have just recently discovered that on February 22nd this year (next Wednesday! ), Disney will be releasing a brand new interactive game within the Magic Kingdom at Disney World called "Sorcerers of the Magic Kingdom" (creative..I know). In this adventure, visitors go on the ultimate Disney scavenger hunt throughout the park, using spell cards and searching for clues to defeat the villains from taking over Disney World. The journey begins with Hades, the Lord of the Underworld from the animated movie "Hercules." He's planning on making the park his summer home, and he's recruited many of the classic Disney villains to help him accomplish such an evil task. Your goal is to use your spell cards to defeat the villains you find in the secret portals around the park. Jonathon Ackley, the producer and creative director to this game, says it's a mix between role-playing games such as "Dungeons and Dragons," and trading card games like Pokemon and Magic. Each card contains a spell based on objects from famous Disney movies, such as Buzz Lightyear's Astro Blaster, and so on. Each spell works better for different villains, and it's your job to try and battle to see which one will prevail. You are issued only five spell cards to begin with, though the more you play, the more you can collect and use for each game (70 cards in total). Each guest experiences different villains and scavenger hunts than the next, and levels can range from easy, medium, and hard. Participants will be taken all throughout Fantasyland, Adventureland, Fronteirland, Liberty Square, and Main Street USA on their journey. My only concern would be with all of the people if this becomes extremely popular...crowding around waiting to see the portals. I've read many comments thinking that this should be moved to a different park, since the Magic Kingdom is already super crowded and packed with activities. Only time will tell! Here is a detailed article with photos of the game. For more Disney updates, subscribe to The Disney Den now! Check us out on Tumblr, Facebook, and Twitter! 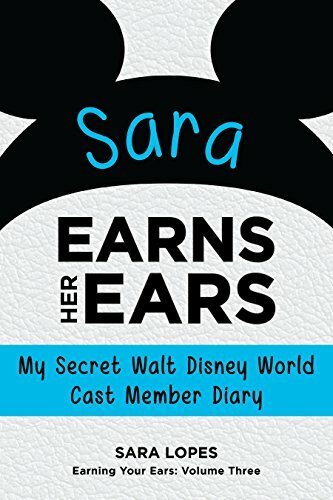 Purchase a Copy of My Book: Sara Earns Her Ears! Learn absolutely everything about my experience with the Disney College Program, as well as tips and advice for applying and participating yourself! I'm Sara. I spend most of my time in Disneyland, blogging, cosplaying, or watching Netflix. I also attended the WDW DCP in Spring 2013 for QSFB! Like "The Disney Den" Facebook Page! Disney College Program Phone Interview!